Now back to the aluminium spacer frame. On my sealed units the spacer frame is constructed from straight edges fixed together at the corners by plastic push-in corner pieces (keys) - this is fairly standard. 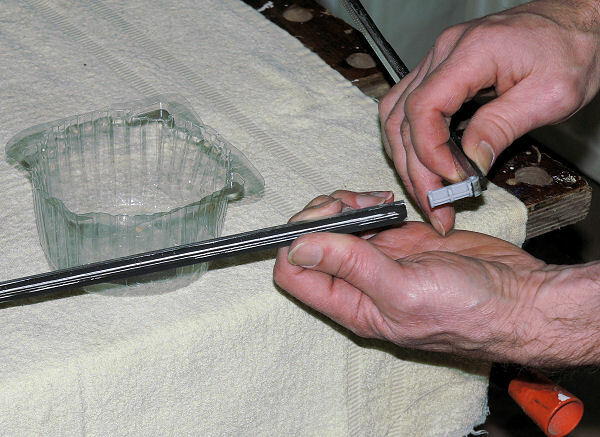 These can be pulled-out to allow the desiccant inside the aluminium spacer bars to be poured out and replaced. 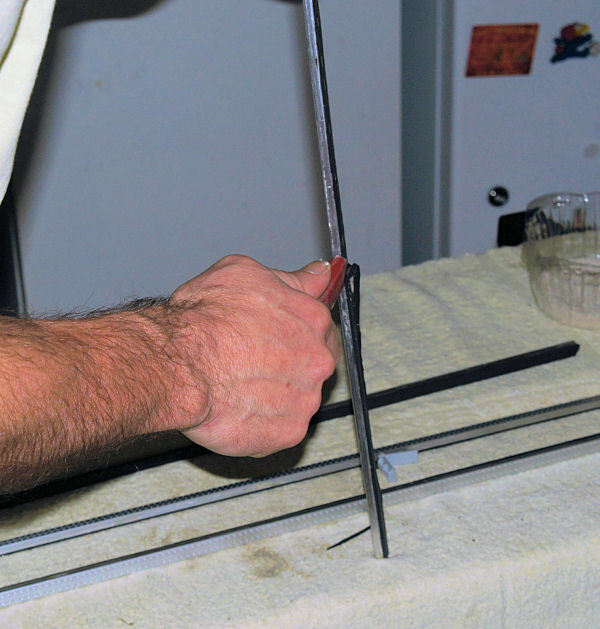 To remove the corner key hold it right on the corner and pull directly away from and in-line with the spacer bar. You may have to make sure all the sealant cleared from the corner area. 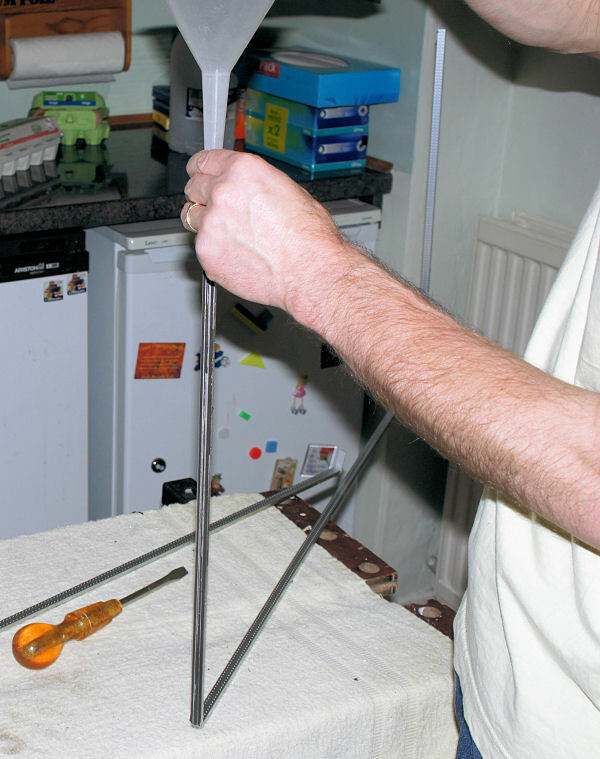 Avoid bending the corner key - it is not strong and you do not want to break it. In particular do not pull on the free leg of the corner key - it will simply bend and break. Keep each spacer bar length horizontal as you remove its corner key - otherwise the internal desiccant may just pour all over the floor. Once you have a spacer bar separated from the rest of the frame take a small container and tip the desiccant out of the bar. ...carefully pull the corner inserts out of the hollow spacer bars.. If the old desiccant is saturated it may tend to clump together - so you may have to encourage the granules out by tapping the bar with a screw driver or similar. Not too hard however - don't damage the bar. UPDATE APRIL 2012. IMPORTANT - Don't discard the saturated desiccant! It can relatively easily be re-conditioned and re-used in the refurbished unit. This should give better results than having to use general purpose silica gel with doubtful dryness..... see below. 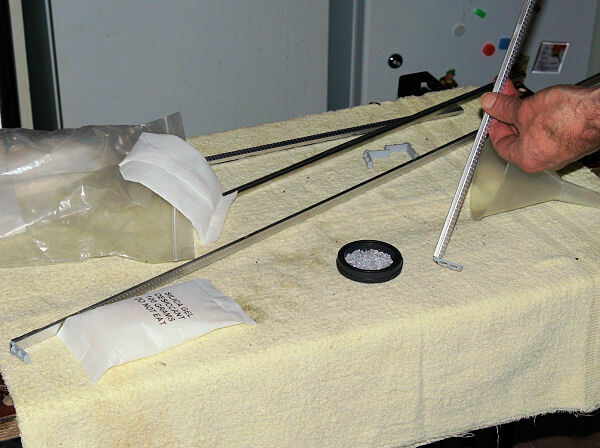 Once you have the the spacer bars separated and emptied of their load of desiccant you can clean them up a bit more - use the sharp Stanley knife to remove as much of the remaining sealant from the surface as you can. It doesn't need to be perfect however. ..spacer frame parts - ready for re-use.. 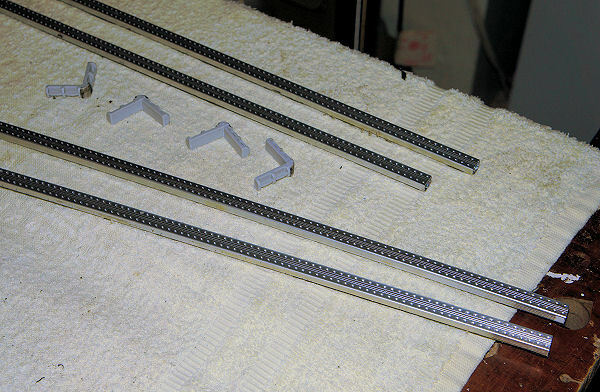 The spacer frame parts are now ready to be re-filled with desiccant and re-assembled. Absolutely the best desiccant to use to re-fill the spacer bars is proper glazing desiccant. This will give the best performance and longest life for the repaired sealed unit. Unfortunately I was unable to obtain this (other than by buying a 25kg box of it!) and I am experimenting with more generally available silica desiccant (2 to 4 mm bead size). This isn't ideal and I'll just have to wait and see how long this lasts, but after about 6 months in-situ my repaired units have remained clear of condensation. Make sure whatever type you use keep it in a sealed airtight container or bag. After about 12 months in situ some of the refurbished units have started to show re-misting, but only when the frames are warm from the sun and moisture is driven out of the general purpose silca gel desiccant I used. Once the frames cool back down the moisture is reabsorbed and the misting disappears. The solution to this is to use proper glazing desiccant as I describe above, OR as I have discovered after a bit of research, to recondition the saturated glazing desiccant that you have just removed from the unit. This turns out to be a relatively straight forward thing to do, and it involves heating the desiccant granules to drive off the water molecules held within them. So long as the temperature is maintained below about 150C the silica gel is not damaged and it retains its ability to absorb water. 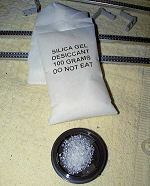 For more information do a Google search for "reconditioning silica gel desiccant". After the first 3 min heat I could clearly see the displaced water condensed around the edges of the dish. I repeated the cycle a further two times, stirring between heating periods. 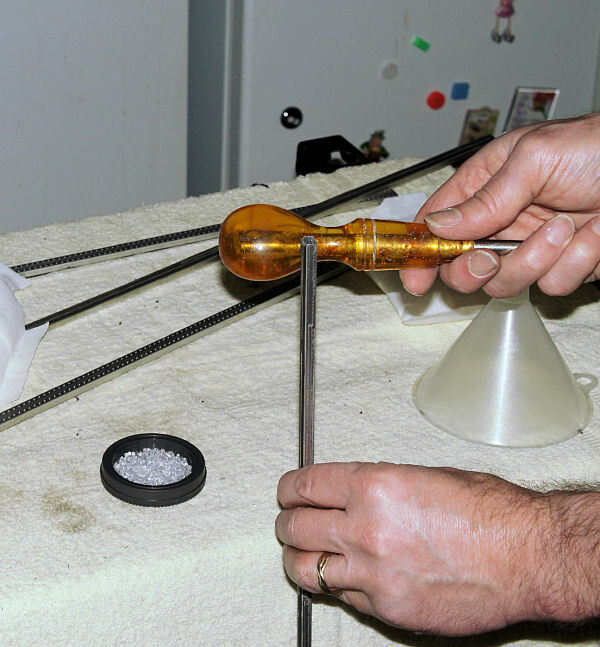 I then allowed the beads to cool sufficiently before re-sealing them in an airtight bag ready for re-insertion in the sealed unit spacer bars. 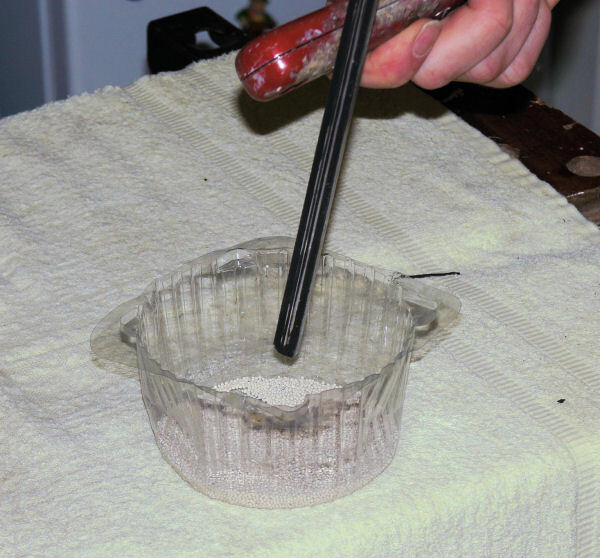 WARNING do not overheat the beads by using a more powerful microwave or heating for too long - it may damage the ability of the silica gel to absorb moisture. 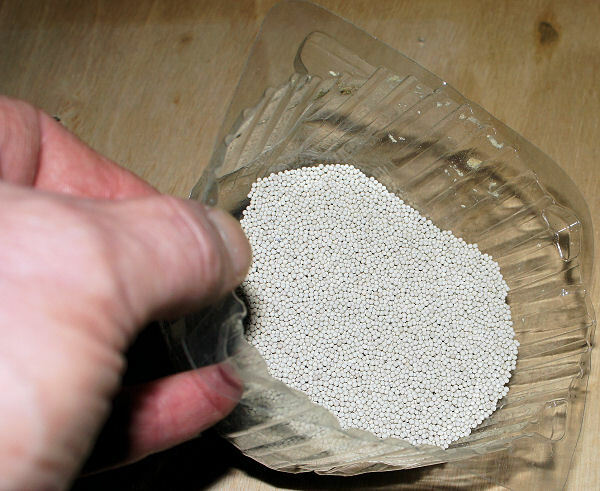 ...spread the damp desiccant in a microwave proof dish. Once cool enough seal in an airtight bag! 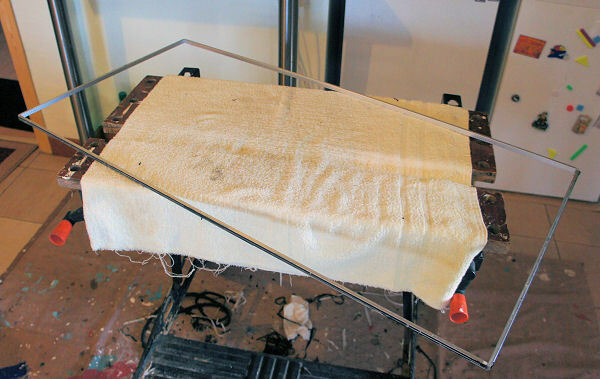 You can see the before and after humidity readings - the simple reconditioning process appears to successfully remove the water contained in the desiccant granules leaving them dry and once returned to the spacer bars, able to do their normal drying job on the air trapped between the sealed unit's glass panes. So use the proper glazing desiccant if you can get it, or recondition the desiccant already in the unit.... it has a smaller grain size than general purpose silica gel, will last longer and will avoid potential gap pressure issues by acting only on water vapour and not other gases in the air gap. ...desiccant I originally experimented with - better to use glazing desiccant if you can get it... or recondition the existing desiccant from the frame. Re-fit the corner keys to one end of each of the two longer spacer bars - I found it easier to re-fill the longer bars first. 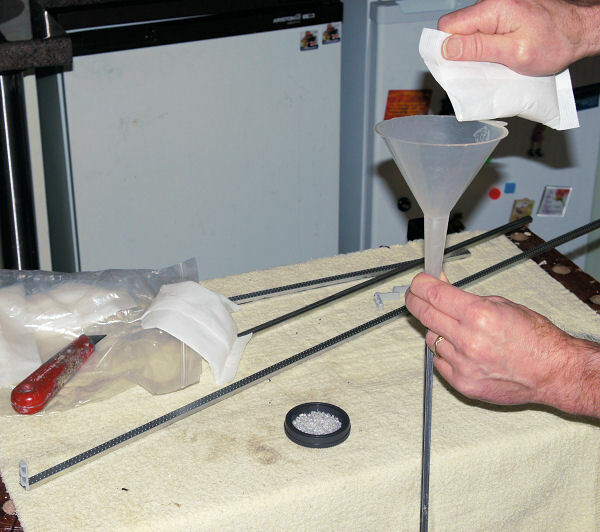 Then, using a funnel, carefully and slowly pour the new desiccant into the spacer bar. Stop and gently tap the bar from time to time to help the desiccant to settle and fill the bar properly. Fill the bar to about 20mm from the top to leave enough clear space for the leg of the plastic corner key to be re-inserted in the bar end. 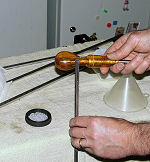 Then re-fit the corner key. Do the same for both long spacer bars. 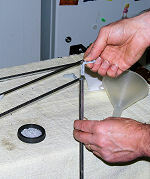 Once you have both long spacer bars re-filled you can re-fit the shorter bars to the corner keys on one of the long bars. Hold the now partially re-assembled frame upright and using the funnel again fill each of the upright shorter spacer bars with new desiccant. Again, tap to help the desiccant to settle properly and fill the bars, leave about 20mm or so clear at the top and, once both bars are filled re-fit the second longer bar with its corner keys to the frame. Now you have the spacer frame refurbished with new desiccant, and two cleaned glass panes you are ready to reassemble the unit and reseal it.